You have played on so many albums and records doing different types of music. Do you have one that you’re more comfortable with, a particular genre that maybe excites you more than playing the others? Well for me to answer that would sort of be a nebulous answer by saying something like Flying Colors, where there is no particular name for it. In other words, where each song can kind of live it’s own life. Like if you’re in a death metal band, you can imagine there’s a certain vibe that has to happen all the time. Same way with a country band or the same way with a polka band playing at weddings (laughs). So I like bands that feel free enough to have variety within the album and within their live set. And that seems more essential to me. In general, I think audiences are more tolerant of variety than music business people are. In a couple of weeks, Deep Purple has a writing session and we’re producing an album with Bob Ezrin, who’s done KISS, Pink Floyd, Peter Gabriel, Alice Cooper, and he also worked on the last Kansas album, when I was with Kansas. So he’s one of my favorite producers and that’s going to be our studio album. It’s probably going to be more of an extravaganza. Everybody realizes we’re not going to do this forever, so to me it feels like this is a really important album to do well. So we’ve got that coming up and mixed in with that, and that is most of the summer with the album, and then I have to leave when they’re doing vocals on that to do the G3 tour. Then I have to come back, repack my suitcase and we go out with Flying Colors and the plan is to do a couple weeks in the US and then a couple weeks in Europe. That brings us to the end of September. Oops, I’m late for the G3 tour and got to get on a plane to go down to South America. Then before they go to Mexico, I have to leave the tour to come back and go straight to Russia with Deep Purple. Then I may have to come back from Russia all the way to the US and repack my suitcase and go back for another five weeks in Europe. Then it’s Christmas and then another year has gone (laughs). Bob Ezrin as a producer seems to be a done deal. There will be Deep Purple writing and recording session (Roger Glover recently hinted that it starts in May), after which Steve goes on tour with G3 (starting in late July) and Flying Colors (tentatively in September). The band reconvenes at the end of October to tour Russia and Europe, by which time the album will be hopefully finished. Read more in Glide magazine. Posted by Nick Soveiko on Wednesday, May 2nd, 2012, filed under News. You can follow comment on this post through the RSS 2.0 feed. You can leave a comment below, or trackback from your own site. If you read between the lines it sounds like the end is nigh for purple. Not really. It could happen, of course. But at this stage in their career they don’t plan anything too precisely, they take it as it comes. They’re gonna do it, then…who knows, they could enjoy it making another one in a year ot two…I don’t think they ‘plan’ to produce a final album as such. The end is going to come sooner or later, but it sounds to me like Steve and hopefully the others want this album to be awesome. There will certainly be a tour so I would strongly suggest if YOU ARE A FAN OF DEEP PURPLE to go see them if you can. When it is over I will have nothing but good memories of all the shows I have seen and I hope there is at least 1 more. If nothing else Jim,the end of Steve Morse as Purple’s guitar player certainly sounds imminent. He’s got a new band that is creative and seems to be making a few waves. Steve looks so bored on the latest Montreux DVD. That is where reading between the lines will always get you. (what you’re fishing for, not much else) The end is physically near, is it not? Who can do this into their 70s? They’ve been critically dismissed by the media who somehow seemed threatened by their level of talent since they reunited, so in the grand scheme of things they were washed up before then and just considered old by non believers. They could’ve packed it in 10 years ago and I would be fne about it, but obviously there isn’t much money in that. You mean they’re not immortal and they will not live forever? Let’s be very honest. They can’t do the same thing forever as they did the last 7 years or so; just doing their ‘greatest hits’ thing and come back for more of the same. I love the band, I love all the DP musicians past and present, and I love almost all the solo output from every DP member and all their projects, but as a real fan I want a proper new DP album. They are right if they want to end in a way they deserve to be remembered as the greatest rock band ever. They should take the time to do it the right way and make it big. All the fans are waiting for that one majestic rock album that they still have in the can. Please pull out all the stops and make the Purple monster roar as loud as it can. One more album with only classic Purple tracks and one more major world tour with the musicians at their very best. And to finish if off the one special big show with all DP members past and present to end with a big bang. I think there are so many fans in the world waiting for that one occasion to come. 2013 is the year of the 45 th anniversary of Deep Purple and this should be the right time to celebrate things in the best possible way. @ 1: They can’t carry on forever. With Gillan turning 67 this year I guess it’s time for him to quit this kind of music after the following album and tour. The other lads won’t carry on without him. They’ve tried over the years but it always came to the point where they realised that there’s just one singer for Deep Purple – and that’s Gillan. He’s the soul of the band. I just hope that their last studio effort will blow us all away! 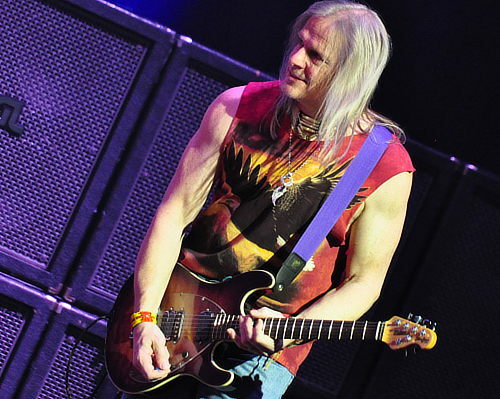 Steve Morse was interviewed for issue 9 of iGuitar magazine in which he talks about his influences, the different bands he has been involved in throughout his career (Dixie Dregs, Kansas, Deep Purple); why he quit music twice and what made him love it again; his equipment and how Deep Purple became his family after the turmoil he was going through at the time. Steve also tells a story about how he used to wear a wig to school to cover up his long hair until they introduced a “no-wig” dress code. Thats what you guys should finally and for all times quit doing. To read “between the lines”. You are not good in it anyway. To paraphrase Steve,everybody realizes the Purps can’t go on forever.If the end is nigh,let’s hope for a rockin’ album to close the book.No Girls Like That or MTV-type sing-a-long silliness.Hopefully,Ezrin will get them in a proper studio and do some pre-production work before he hits “Record”. Come on Steve, don’t be so obvious! We got the message already. I agree. But if so they can say the show ended things on their terms. The recent Canadian tour found them in great form (helped perhaps by the relatively smaller and more intimate venues). And one can only hope the new album (and hopefully associated tour) will have them go out on a high note (NPI). After forty plus years of excellent music and entertainment, I they’ve earned a break. Tonics in the sun. Good to at last have positive signs and yet as per Jim’s comment, seems like a swansong album- well, it had to happen sooner or later, so let’s hope it is a memorable one with a new classic or two on it…. Classic Rock Magazine states that it appears Purple is winding down. Morse has alluded to the fact that they are obviously not getting any younger and that ‘this album needs to be special’. He took the words right out of my mouth. Folks, we are at the end of the ‘Purple Rainbow’ it seems. It’s been a loooooong and awesome run. I am glad they are taking this serious and putting Bob Ezrin at the helm for their final record. This album and tour in promotion of it should be balls to the wall and no holds barred. As a matter of fact, I would love to see Ezrin re-produce and re-package ‘Bananas’ and ‘Rapture of the Deep’ with proper production. Though I am looking forward to this album, I am not looking forward to the fact they are most likely done soon afterwards. Yes I know it has to happen eventually, but it doesn’t make it any easier to swallow. I’m 55 years old. Been a fan since I was 12. This band has been a part of over 3 quarters of my life. Alice Cooper also. 2 of my favorite bands. I think it’s perfect that Bob Ezrin has been chosen for this final vinyl. I also believe that Purple will be nominated and inducted into the Rock & Roll Hall of Fame next year as a result. “Welcome to My Machinehead”. Both JLT and Morse ae being interviewed in the new Record Collector. I read the same, Jim, but then, Purple has already died several deaths, and so all of us true believers will go on waiting for the resurrection, right? I guess it’s very well possible that this might be the last DP album. I think I saw in another interview that Steve Morse did say that he thinks that things with Purple will be naturally slowing in the next few years. Ian Gillan is 67 alright, and sometimes his voice is not that good anymore. Guess that is just what happens with age.. And yes, I think we should all try to catch Purple live while we still can!